San Diego Dynasty, an Empire Paintball team, is holding tryouts this weekend. 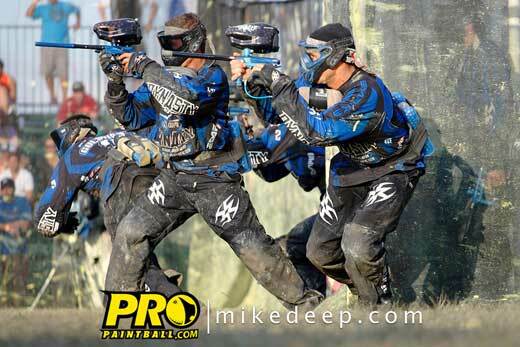 We have heard that a large group of talented pro paintball players will be mixing it up. Notable mentions include Andy Horvath (Mutiny), Jason & Corey Bornstein (XSV), Josh Victorio (Cobra’s) and Rusty Glaze (LA Infamous), Jon Richardson (LA Infamous) and Sean “Crunchy” Mcdonald (former SDA/Ironmen) will be mixing it up. The word is these players are competing for one or possibly two spots on the paintball super team and only the best will make it. You may be wondering what spots these players are looking to fill on Dynasty. ProPaintball insiders suggest that the openings are for the Xball/Race-To roster. Possibile openings on the roster may come from Dynasty players Spitts, McCormic and Mouse. According to rumors, Steven Pitts has set his sights on completing his college degree and is taking a full course load. Another possibility comes from McCormick. Mike was missing at the teams first official practice of the season which is typically not a good sign. No word on if he will return or not this season. Another question mark sits next to Alex “Mouse” Goldman‘s name. According to sources, Mouse is considering scaling back his professional play to one league so that he can focus on work, school and his girlfriend. Which player would you most like to see join San Diego Dynasty? Who would make the strongest addition? If you enjoyed this article, please follow @ProPaintballCom on Twitter!